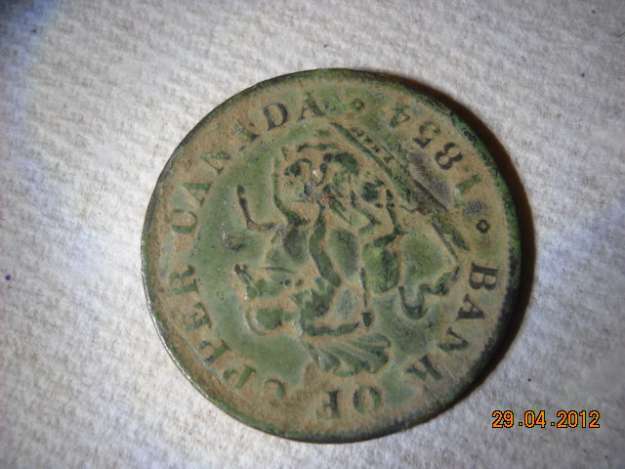 I would appreciate any information anyone can give me about a coin marked One Penny Bank Token and 1857 Bank of Upper Canada. It is approximately the same size as a 1967 silver dollar, copper coloured (very dirty), and obviously well-circulated. I am simply curious, not very knowledgeable about things numismatic, and not a collector. Thanks in advance for any help. I would imagine that you are talking about the token with St George slaying the dragon on the Obverse. The Bank of Upper Canada was started in 1820 in York, Ont (Toronto). Many banks and merchants issued tokens through the first half of the 19th century, because there was no coinage for trade/goods to be had, except those of other countries,including the US. 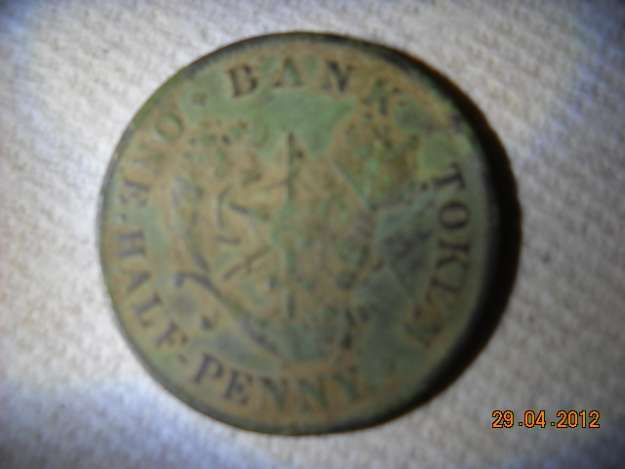 That series of tokens was struck in 1850, 1852, 1854, and 1857 in both the half penny and one penny denominations. There are about 300 different varieties(mint anomolies) in the series. The Bank of Upper Canada tokens are some of the most common of all the Canadian tokens and, except for a few scarce varieties, can be had for a few bucks on Ebay or dealer discount boxes at most any coin show. The retail book price for one in Fine condition (which is pretty worn) is about $5. Many thanks for the info, BillinBurl. My wife and I metal detect and she found an American LC penny and the next night I found this. Was quite excited as this is my oldest coin to date. My wife's coin is an 1850 American LC.